Details relating to the Cypriot Commemorative of 2017. This is the first Commemorative Coin issued by Cyprus and it features the Roman Odeon at Paphos. The Odeon dates back to the 2nd century AD and is still used in the summer for musical and theatrical performances. The motif is interesting – it shows an aerial view of the theatre. We see in an arc in the upper half of the inner circle the banked rows of seats. In the lower half of the inner circle is the stage. 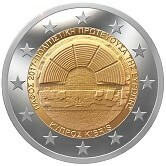 The coin features an inner ring within which, running from eight to four o’clock is the following inscription: ” ΠΑΦΟΣ 2017 - ΠΟΛΙΤΙΣΤΙΚΗ ΠΡΩΤΕΥΟΥΣΑ ΤΗΣ ΕΥΡΩΠΗΣ"" (Paphos 2017 - European Capital of Culture). At the bottom of the ring is the country designation " ΚΥΠΡΟΣ KIBRIS “. Return from Cypriot Commemorative 2017 to euro coin collector.